Reason for Reading: I was looking for a simple how-to book on meditation. Synopsis: Hanh, a zen master, explains meditation techniques that keep the mind focused on the current moment. 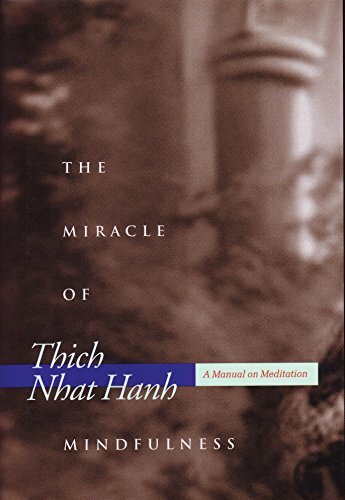 Through short anecdotes and instructions on breathing techniques, Hanh shows the reader how to live in the current moment instead of dwelling on the past or future. Why you should read this book: The Miracle of Mindfulness is deceptively simple – it’s a short, quick read, but once you experiment with the techniques Hanh presents, you’ll quickly appreciate just how much he’s packed into such a small book. Had it been bigger, the size may have been intimidating to newcomers, but Hanh keeps it concise and understandable. Although the ideas presented are from Buddhism, no previous knowledge or beliefs are required, as most of the book can be read in a fairly straightforward manner by people simply looking for stress relief and a way of appreciating life on a deeper level. Great tips for feeling more tranquil and calming down from a burst of anger. Why you should avoid this book: At times, there’s a slightly holier-than-thou tone, mostly when Hanh talks about modern conveniences like dishwashers or is explaining mindfulness to an ignorant friend innocently eating an orange in a heedless manner. Thanks to our ‘right now’ society, you may have the urge to rush through the book, but work and lot of time have to go into the concept of mindfulness. Expect to read it more than once for full benefits (another advantage to the shortness of the book). Yesterday Allen came over to visit with his son Joey. Joey has grown so quickly! He’s already seven years old and is fluent in French and English. He even uses a bit of slang he’s picked up on the street. Raising children here is very different from the way we raise children at home. Here parents believe that ‘freedom is necessary for a child’s development.’ During the two hours that Allen and I were talking, Allen had to keep a constant eye on Joey. Joey played, chattered away, and interrupted us, making it impossible to carry on a real conversation. I gave him several picture books for children but he barely glanced at them before tossing them aside and interrupting our conversation again. He demands the constant attention of grown-ups. Thus mindfulness is at the same time a means and an end, the seed and the fruit. When we practice mindfulness in order to build up concentration, mindfulness is a seed. But mindfulness itself is the life of awareness: the presence of mindfulness means the presence of life, and therefore mindfulness is also the fruit. Mindfulness frees us of forgetfulness and dispersion and makes it possible to live fully each minute of life. Mindfulness enables us to live. While sitting still and breathing slowly, think of yourself as a pebble which is falling through a clear stream. While sinking, there is no intention to guide your movement. Sink toward the spot of total rest on the gentle sand of the riverbed. Continue meditating on the pebble until your mind and body are at complete rest: a pebble resting on the sand. Maintain this peace and joy a half hour while watching your breath. No thought about the past or future can pull you away from your present peace and joy. The universe exists in this present moment. No desire can pull you away from this present peace, not even the desire to become a Buddha or the desire to save all beings. Know that to become a Buddha and to save all beings can only be realized on the foundation of the pure peace of the present moment. Also recommended: How to Practice by His Holiness the Dalai Lama. Also by this author: Calming the Fearful Mind: A Zen Response to Terrorism; The Long Road Turns to Joy: A Guide to Walking Meditation; Stepping Into Freedom: Introduction to Buddhist Monastic Training; A Taste of Earth: And Other Legends of Vietnam; Interbeing: Fourteen Guidelines for Engaged Buddhism; Joyfully Together: The Art of Building a Harmonious Community; Opening the Heart of the Cosmos: Insights from the Lotus Sutra; Our Appointment with Life: Discourse on Living Happily in the Present Moment; Truly Seeing; Touching the Earth: Intimate Conversations with the Buddha; The Sun My Heart; Hermitage Among the Clouds; Transformation and Healing: Sutra on the Four Establishments of Mindfulness; The Ultimate Dimension: An Advanced Dharma Retreat on the Avatamsaka and Lotus Sutras; Peace Begins Here: Palestinians and Israelis Listening to Each Other; Essential Writings; Anger: Wisdom for Cooling the Flames; Be Still and Know; Being Peace; The Blooming of Lotus; Breathe! You are Alive; Cultivating the Mind of Love; Freedom Wherever We Go; True Love: a Practice for Awakening the Heart; The Diamond That Cuts Through Illusion; For a Future to Be Possible; Going Home: Jesus and Buddha as Brothers; The Heart of the Buddha’s Teaching; The Heart of Understanding; Living Buddha, Living Christ; Old Path, White Clouds; The Path of Emancipation; Peace is Every Step; The Present Moment; Present Moment, Wonderful Moment; The Sun My Heart; The Sutra on the Eight Realizations of the Great Beings; Teachings on Love; Thundering Silence; Touching Peace; Transformation at the Base; Zen Keyes; The Raft is Not the Shore; Mindful Living; Taming the Tiger Within. Fun tidbit: Exiled from his native Vietnam in 1966 during the war, some of Hanh’s resulting initiatives have been helping refugees, working to rebuild destroyed villages, starting a magazine on peace, and encouraging non-violence to world leaders.